This chapter relates to all levels of matters. Below is a table summarising the options available for reconsideration or review of Abacus decisions. This chapter should be read in its entirety for full explanations. The Commissioner has approved the following internal grievance resolution procedures for Abacus matters under section 7(2)(g) of the Police Service Act 2003. The grievance procedures at Part 1.4 of the Tasmania Police Manual (TPM) do not apply to Abacus matters (whereas they do apply to other administrative decisions). Further external review by the Police Review Board of some actions is available to subject officers under section 60 of the Police Service Act 2003. In relation to a level 1 matter, if a subject officer is aggrieved on the basis that they believe they have not received procedural fairness, they are entitled to lodge a Reconsideration Request. Subject officers are also entitled to lodge a reconsideration request in relation to a Continuing Professional Development (CPD) they are to undertake as part of the managerial resolution of the matter. These matters do not involve a determination other than ‘no breach’ and there is no finding or section 43(3) Action, therefore a reconsideration request cannot be lodged on the ‘no breach’ outcome. Reconsideration requests are submitted by the subject officer directly to the authoriser’s commander (or, if the authoriser is a commander, to the Deputy Commissioner) in the format of a subject report. The subject officer also must provide a copy to the authoriser. A reconsideration request can be allocated to another member by the commander (or Deputy Commissioner where applicable) for consideration. The request must be submitted within 30 calendar days of level 1 matter being finalised or of the subject officer receiving notification of the CPD. A request submitted after 30 calendar days will not be considered. Reconsideration requests and associated documents and decisions must be recorded on BlueTeam / IAPro by the member responsible for considering the request. Sergeant X is allocated an IRM 1 involving Constable Y via BlueTeam. Sergeant X decides that, as a CPD, Constable Y is to brief Sergeant X daily on his activities and outstanding workload for one month. Inspector Z authorises this CPD. Constable Y is aggrieved by this decision and submits a reconsideration request to his commander about the CPD and provides a copy to Inspector Z. The commander uploads a copy of Constable Y’s reconsideration request on BlueTeam. The commander considers the request and advises Constable Y and Inspector Z. The commander records all decisions regarding the reconsideration request on BlueTeam. Level 2 and 3 matters may result in a determination that a subject officer has breached the Code of Conduct. A determination may also be made that the subject officer will receive one or more formal section 43(3) action(s) and CPDs. Continuing Professional Development (CPD) the subject officer is to undertake. authoriser’s decision in relation to medals. The request must be submitted within 30 calendar days of the level 2 or level 3 matter being finalised. A request submitted after 30 calendar days will not be considered. Reconsideration requests and associated documents and decisions must be recorded on BlueTeam / IAPro by the member responsible for considering the request. Under section 60 of the Act applications for review must be made in writing and include the grounds for appeal. Applications must be lodged within 30 calendar days after the subject officer has received the Final Report notification of the matter about which they are seeking review. The subject officer must provide the Commissioner with a copy of the application within three calendar days of lodging the application. The subject officer may also withdraw the application if they reconsider. Review may be available pursuant to the Judicial Review Act 2000 provided certain criteria are met. Applications must be made within 28 calendar days after the ‘relevant day’ which is defined by the Judicial Review Act 2000. Subject officers may seek legal advice (normally at a member’s own expense) or assistance from the Police Association of Tasmania (where applicable). demonstrated that procedural fairness requirements were met. 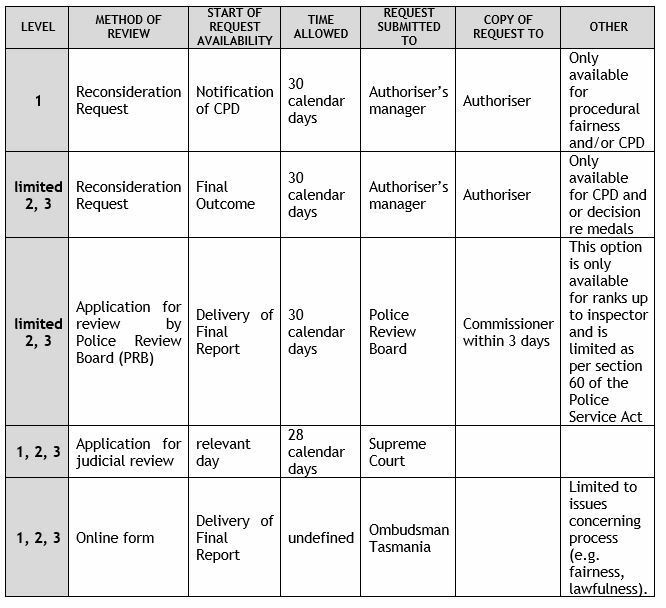 Ombudsman Tasmania will not accept complaints where a member has an avenue of review through a court or the Police Review Board and generally requires that members attempt to resolve a complaint with the entity complained about in the first instance. This page -- https://www.police.tas.gov.au/about-us/abacus/14-review-decisions/ -- was last published on March 1, 2018 by the Department of Police, Fire and Emergency Management.